Innovative hydro flume technology activates the footing sphere to engage core muscles throughout the workday. 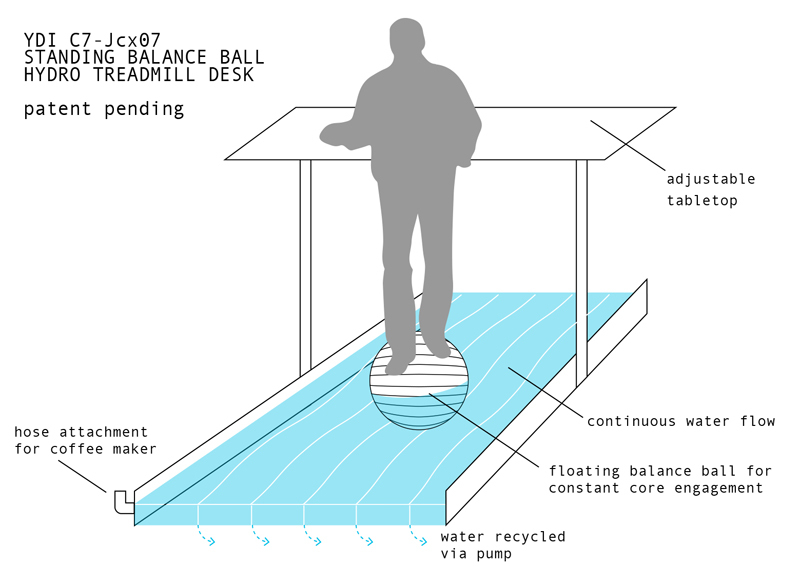 The Standing Balance Ball Hydro Treadmill Desk is a dynamic workstation that generates energy as it enhances employee fitness by harnessing the power of movement throughout the traditionally sedentary workday. While sitting is currently ranked as the world’s #1 position, due in large measure to one of YD Industries most successful products, funded scientists are just now now seeing the benefits of exercise in overall health. By incorporating fluid dynamics, unstable platforms, adjustable shelving, and long tail process technologies, this YD Industries designed product is poised to change the fundamental nature of offices world over. The unit comes with an adjustable desk that works for heights ranging from 4′ to 6’10”. The water flume jets can propel the walk speed from .25/mph to 25/mph, and are easily set via a desktop mounted keypad complete with a detachable safety key. Comes with a built in fire-extinguisher, electronics power strip, desk plant clasp, and bluetooth thermometer. Can be docked with 7 other workstations for effective and engaging meetings. Order now. This is the best. I really need one of these. YD Industries dedicates itself to pushing the envelope of innovation to improve the lives of humankind, and forge a stronger America. The company spans countless business units (Biotech, Food Sciences, Electrical Engineering, Web Services, Venture Capital, etc.) and was recently awarded a record 38th Gold Diamond by Hapsa Quarterly.